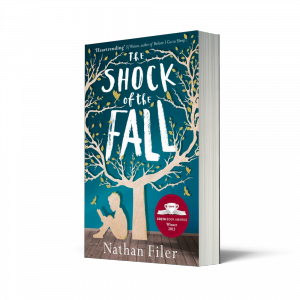 Nathan Filer’s character in “The Shock of the fall” loves his Nanny Noo. I was reading this during the time poor Robin Williams’ mind was disturbed, thinking of “Nanoo Nanoo” every time she was mentioned. My thinking didn’t save him. Maybe he didn’t need saving – except for us. Commentators claimed they were so shocked. Really? Wasn’t it obvious to us all that he was working too hard to be happy – and to make us happy. When he decided that he had had enough he went. Depression does not always make us want to die – it always makes us want ‘it’ to stop. Sometimes ‘it’ ends up being life that must stop, but that’s all. It doesn’t want us to hurt our loved ones – it often feels ‘you’d be better off without me.’ It sometimes wants us to hurt ourselves – but not in dying – in living. Physical pain preferred over the mental. Filer has written a novel about mental disability and mental health – not the same thing. From the start we are not sure if they affect the narrator. We explore through a set of characters, beautifully observed by Filer in his work as a mental health nurse: Down’s Syndrome, Drink and Drug abuse, Self Harm, Depression, Grief, Suicide, Obsessive Compulsive Disorder and Schizophrenia, alongside attitudes to them: Parental, Institutional, Care in the Community, Drug Regimes, Care Planning Committees and the gamut of patronizing ‘Does he take Sugar?’ behaviours. It is not easy for us to read at length, factual expressions about serious issues. Therefore I thank the author for attempting this unusual and searching story, to find for us real situations to extend our understanding of the issues we in the community are supposed to care about. And like Robin Williams, it’s moving and funny, too.